This was a great hunt, on a beautiful property. But the hogs were scattered, and getting close with a bow is tough enough even in ideal conditions. Still, it was a blast! When "Chopper" Snyder sends you up a ridge on his lease, and tells you where to look for hogs, then by gosh you need to LOOK when you get there! It helps to have an arrow ready, too. That's what I learned after a weekend hunt (2 1/2 days) at his place near Hollister, CA. I'd been talking to Chopper on the forum at Jesse's Hunting and Outdoors, and wanted to set up a hunt with him some kind of bad. He runs semi-guided archery hunts on about 4000 acres in San Benito County, about halfway between the town of Hollister and Pinnacles National Park. Available game includes wild turkeys, wild hogs, and blacktail deer. The place is crawling with these and other game, particularly California quail. Non-game species are also abundant. It's a well-managed piece of land, there's no doubt. Most of the roads are well graded, making it pretty easy to get around. You might want to take the "guided tour" to get oriented, though, as the roads do wrap and twist in a pretty confusing pattern. I took that tour on my first night at the ranch, and I still don't think I could find my way back to half the roads he rambled with that Dodge Ram. But what I do remember was acre upon acre of prime habitat. Thickets of pine, scrub oaks, and poison oak predominated. Selected areas had been cleared, while others were densely grown chapparal. What pig wouldn't want to live here? I couldn't wait for morning, and my first chance to get out with the bow. This trip had been organized through Jesse's forum, and there were nine hunters. Typically, Chopper keeps his hunts to around four to six people, with a maximum capacity of eight. One late-comer got in under the wire to allow for our nine hunters. This may seem like a crowd, but Chopper knows that property inside and out, and he was able to put us all in good territory with no overlap. That says a lot, not only for the property itself, but for Chopper's skills as a guide. On that note, I'll say this now. Chopper works hard to make sure his hunters get on game. He doesn't make any guarantees, and since the hunts are archery-only, it's tough hunting, but he does everything in his power to make sure you have a good hunt. 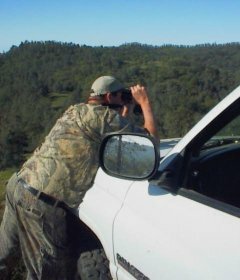 If he sees hogs during the hunt, he will re-locate hunters to get them in position. If you hit one and it runs, he'll be there with his tracking dogs to locate the animal. And while you're typically on your own to dress and skin your hog, he's got the top-notch facility for taking care of it... including a walk in cooler to let it hang while you go out and try to score another one. Chopper glasses for feeding hogs. If he can find 'em, he'll put you on them. After our tour, we arrived back at the "cabin". Now I've stayed in a few hunting cabins in my life, but I wasn't prepared for this place. From the hot and cold running water, to the propane generator and electric lights, there was little to ask for. Even the view was spectacular, gazing out over the county all the way to the Monterey coastline. At any rate, the warm lights and smell of grilled meat were welcome at the end of our drive. As we piled out of the truck, though, one of the other hunters, Kirk, walked up with "that look". Turns out, he'd hit a hog at last light, and rather than risk tracking it in the dark he decided to wait until morning. Not bad, I thought. First evening hunt, and there's already blood on the ground! The evening's festivities were fairly short, but suffice it to say that spirits were high and spirits flowed freely. Many of us had "chatted" to one another on the forum for years, but this was a first personal meeting for several of the guys. Putting faces and names to screen-names is always a pleasure. But dawn would come early and we had to get to bed. In the interest of space, I'm forced to condense the full experience hunting at Chopper's. My first morning, though, sets the tone for the entire weekend. Just after sunrise, less than 200 yards from the truck, I stumbled onto a roost tree in which a flock of turkeys was just waking up. I worked my way around them, following hog trails overlapping more hog trails. Most of the tracks were old, but the sheer number was amazing. When I finally reached the ridge Chopper had sent me to, I was exhausted. He'd told me the hogs would cross the clearcut on top of the ridge, and when I found the spot I dropped down and opened up a water bottle. As I took my first sip, I caught movement off to my right. I watched slack-jawed as two hogs trotted across the trail, less than 30 yards away. My bow lay, useless, about two feet from my right hand. I jumped up, grabbed the bow and quiver, and took to the hogs' trail. Unfortunately, just as the trail hit the thickest chemise, the individual tracks were lost in a jumble of fresh sign. There was no way to trail the right hogs, and in this thick stuff I'd never be able to draw and shoot anyway. I worked my way back to the hilltop. I worked the ridge to the end, then followed the trail down to where Kirk had shot his hog the night before. I had heard them on the radio coming in to search for the hog, but didn't know if they'd found the hog or not. Turns out, they had. The day was warming up, and I was kind of hoping that they'd still be there. A ride back to my truck would be nice. As it turns out, Kirk was the only hunter to score that weekend. For whatever reason, the hogs were really scattered and nocturnal. I had several more close encounters with hogs, including two more that first evening, then several more on the following day. On the last evening, I stalked a nice boar to within 40 yards (I shoot traditional, and my maximum range is 20-25 yards), until the wind finally swirled and gave me away. Several of the other guys also had seen hogs, but none had an adequate opportunity. But hey, that's hunting, right? I couldn't find a single guy in the bunch to complain about the outcome. We'd had a weekend on a beautiful ranch, with tons of animals. We'd also enjoyed the company of good folks and great food. The fact that all but one of us went home without pork hardly dampened anyone's spirits. After all, there are no guarantees in this sport, unless you want to hunt inside a pig pen. What I will say is that the hunt is every bit worth the $400 price tag. 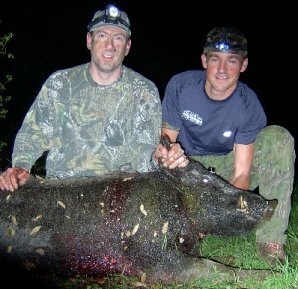 You do have the opportunity to take two hogs on a weekend hunt, and several hunters have done so. Just don't count your hogs until you've got them on ice, though. Chopper's hog hunts start in late winter, or as soon as the roads are passable, and continue through June. He says that during the coldest part of winter, the majority hogs usually vacate the higher ground on his place and go down to the valley floor. Summer hunts should be very productive on this property, with several nice stock ponds, a barley field, and plenty of good cover. During the A-zone deer season which runs from July through October, he doesn't run any hog hunts since he's guiding for deer at this time. You can find out more about Chopper's hunting program at his website, www.birdsandboars.com. You can also give him a call at: 831.682.0468. He's in the field a lot, so leave a message if he doesn't answer. Several of the guys went back the following weekend in order to have a chance at turkeys, as well as one more shot at those hogs. On this trip, two very nice boars were taken. Jesse (Bubba on Jesse's Hunting and Outdoors forum) took this appx. 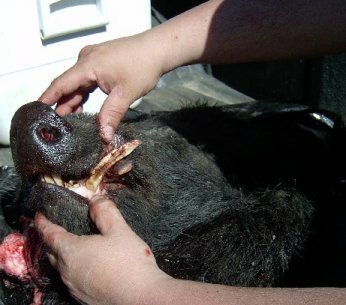 200 pound trophy boar with 3" cutters when he went back for one more go at Chopper's place. He's glad he went back! 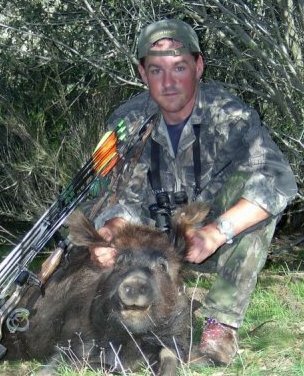 Steve (BDB on Jesse's Hunting and Outdoors forum) took this nice boar on his return trip to Chopper's. Kirk (Arrowslinger) helped him track the creature almost a mile, and apparently had to put the coup d'grace on the big boy in very close quarters. Remember, they were BOW hunting... no firearms.